Even though I have decluttered quite a bit of stuff, I still have a lot of glassware and crockery in the sideboard that do not get used every day. I recently cleaned out the drawer in the kitchen which hold the mugs and glasses. I off-loaded some of the odd glasses from the back of the drawer which were never used as well as some plastic tumblers which were all crazed and for which we no longer have the matching jug. I could have left the excess space but instead, I decided to add 5 coloured glasses which have been in the sideboard. There were once 6 of these glasses which came from my parents’ place. I always loved them and they were for special occasions. It would be easy to fall into that trap but I decided that since I really like them I will use them every day. If they get broken I will not mourn, instead, I will be glad that had the opportunity to use and enjoy them. I have not taken the time to respond to your comments on my previous post but I will do so, hopefully tomorrow. 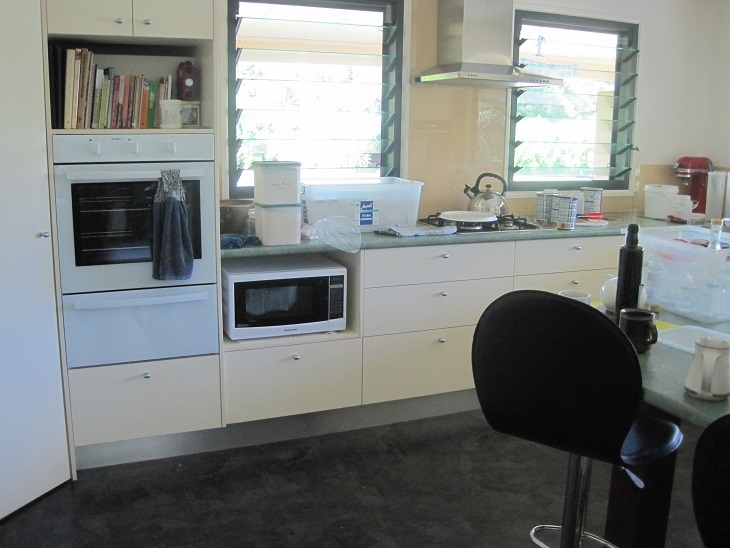 It is great to feel that the decluttering efforts are really making a difference. 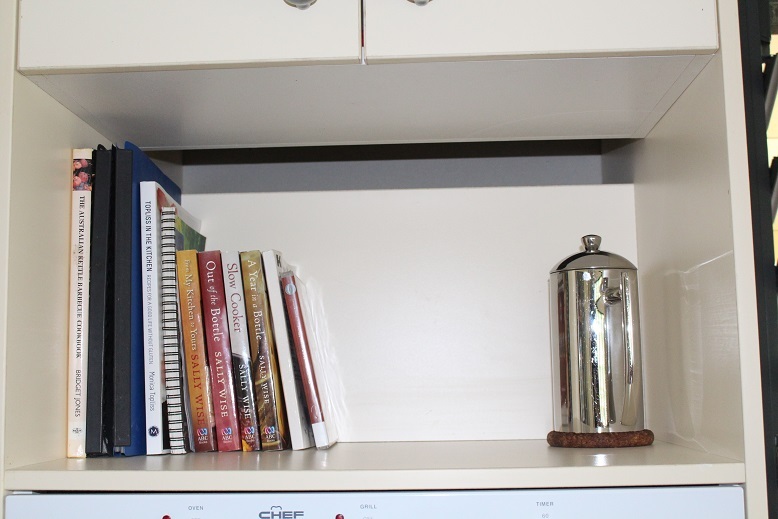 This morning I noticed that the shelf where my recipe books are stored was very grubby and needed cleaning. It was a simple matter of grabbing an armful of books and placing them on the bench while I wiped down the shelf and then replaced the books. This took me less than 2 minutes. I have never had hundreds of cookbooks but nevertheless it has taken about 3 rounds of culling to get it to this. You can read about a previous effort here. That was about 14 months ago but a few more have moved on since then, too. I do not miss any of them and have not have occasion to regret my decision to move them along. Recipes are something that has really been revolutionised by the advent of the internet. There is nothing you cannot find. Also, recipes are like clothes – there are definitely trends and fashions. Do you have recipe books? Have you reduced your collection? A couple of days ago I read a comment online by someone unknown to me that they had decluttered so much that they had nothing left to declutter. I have no idea what their circumstances are or what they consider essential but I know that I have not reached that point. In fact, I am not sure that I ever will or even want to. We do not have a huge amount of stuff but for me it is more about carefully streamlining what we own to a selection of good-quality items that match our lifestyle. Our needs change and therefore, our possessions will change accordingly. On the weekend I was cleaning in the kitchen and one thing led to another and I ended up re-looking at the cooking utensils that I use. I have supposedly decluttered these on at least 2 previous occasions but it never hurts to look at them with fresh eyes and a more detached point of view. This is what I am taking to the op shop today. There are a couple of sharp knives that have seen better days and I simply do not use them. A scraper for cleaning a George Foreman grill which we no longer own. A cleaning brush for something – I don’t know what and as far as I can see it has never been used. Spoon and spaghetti strainer which are not used. Meat mallet – I haven’t beaten meat for over 20 years – our diet does not include recipes that require it. Spaghetti measure – was part of a corporate Christmas hamper a few years ago and has never been used. Small aluminium skewer – I have a set of stainless steel skewers and this is no longer required. Chip cutter – this came from my mother’s place when she was decluttering some years ago and I have never used it. A good idea but I cannot remember the last time I made chips at home and I am quite capable of cutting potatoes into chips if the fancy happens to take me. Anyway, aren’t “hand-cut chips” the latest craze on menus?? The electric knife/carving fork and cherry pit remover are the only items that would be rarely used. Everything else is used regularly, mostly on a weekly basis. Some, like the grapefruit knife and corn cob holders are seasonal but still essential. 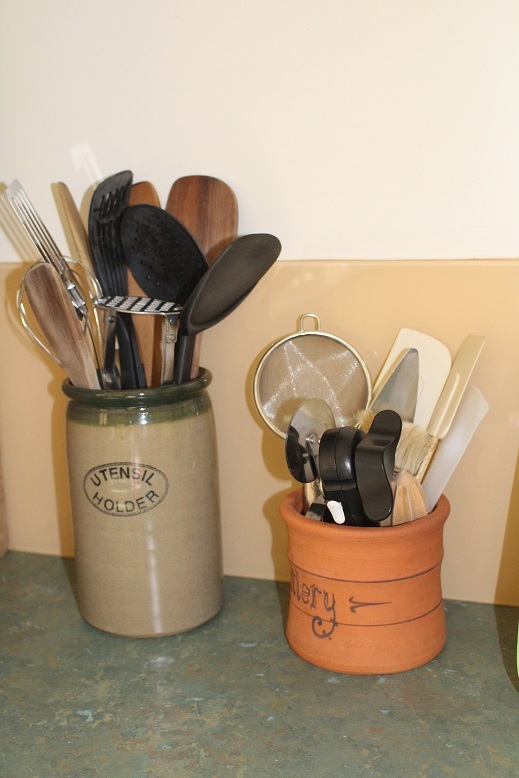 I also have 2 jars of cooking utensils that I use almost daily. There location on the bench means that they are easy to grab as I am cooking and preparing food. I also have a knife block with 6 assorted sharp knives. 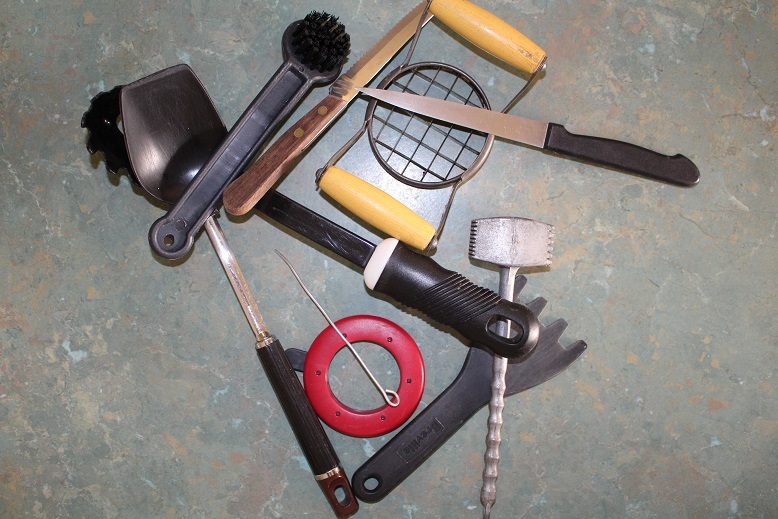 To a hard-core minimalist this probably looks like a huge number of utensils, however, I prepare and cook most of our meals and use these items very frequently. It is important to keep and use what works for you. There are lots of areas of my life where I could reduce my possessions but I think I have completely decluttered the kitchen utensils to my satisfaction. 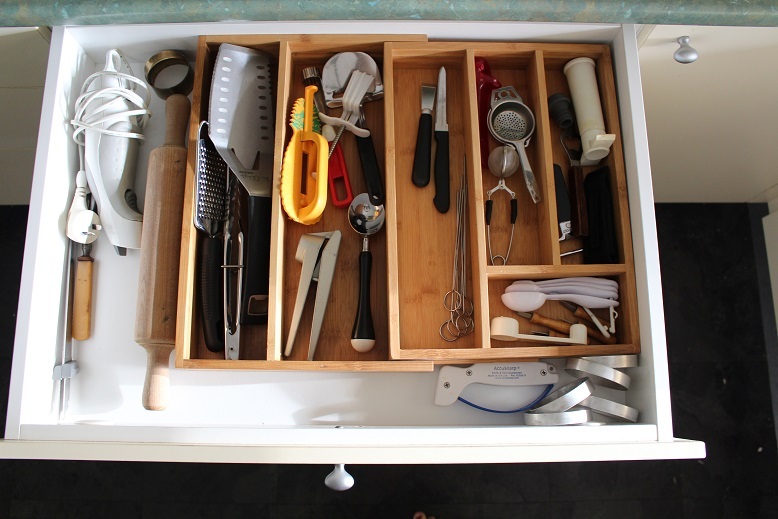 What utensils do you use every day? Are they much different to what I have shown here? 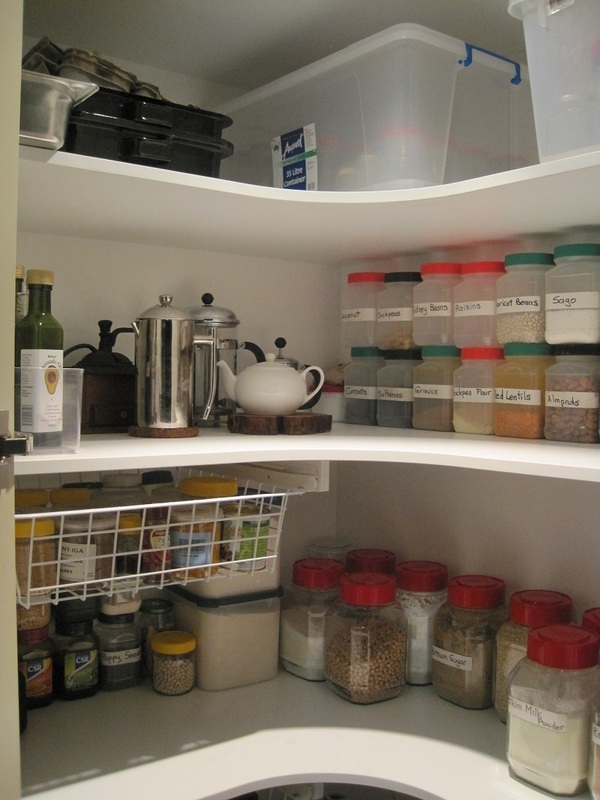 Even though my pantry was reasonably organised, I decided to give it an overhaul today. I had noticed that there were a few things stashed in containers at the front of the shelf that needed to be used or relocated. This is what it looked like before I started. The photo does not show the top shelf which has 2 tubs of glass jars – ones with pop-top lids in one tub and those without in the other. I sorted all of the jars, made sure they all had lids, labels had been removed and were ready to be used when I need them. I took a lot of the stuff out and re-arranged the jar storage system so inevitably things looked a lot worse before they got better. 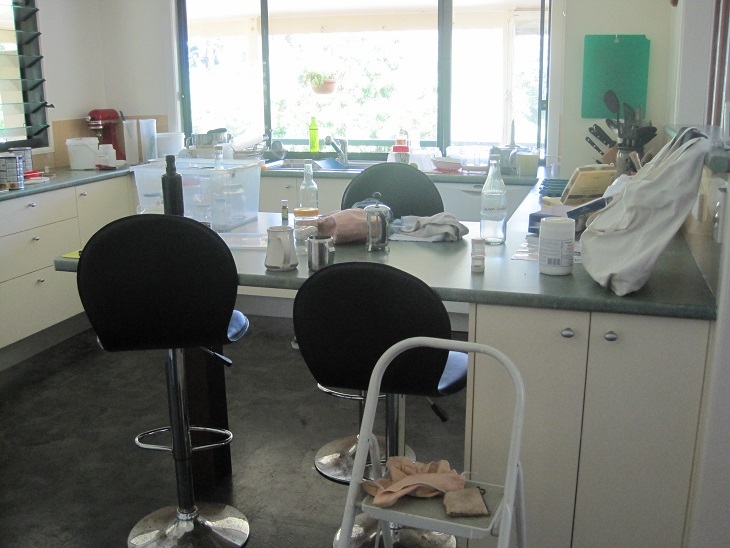 Here is a view of the kitchen earlier this afternoon. To add some interest to my day, The Duke announced at lunchtime that there were 3 branches that needed trimming of the lime tree but they were laden with fruit. He was prepared to leave them for the time being but since the tree is never completely dormant I decided now was as good a time as any. I picked a 10 litre bucket full of limes and cut the offending branches off. So, in the midst of the pantry project I juiced the limes and have frozen them – some in ice-cube trays and some in 400ml blocks. I moved a couple of things from the pantry to the sideboard so we cast a critical eye over the contents of the sideboard. The Duke and I agreed that a few things could go. A true minimalist would probably get rid of almost the entire contents but that is not my style. However, it is good to refresh your memory of what is actually stored and I have resolved to use some of my ‘good’ things more regularly. My op shop bag is now full and ready to go when I am next going to town. I also have a bag of a few items for Belle. I always offer anything which I think may be useful to my daughters before I consider sending it to the op shop or Freecycle. However, they understand that there is no compulsion for them to accept it and I will not be mortally wounded if they say no. 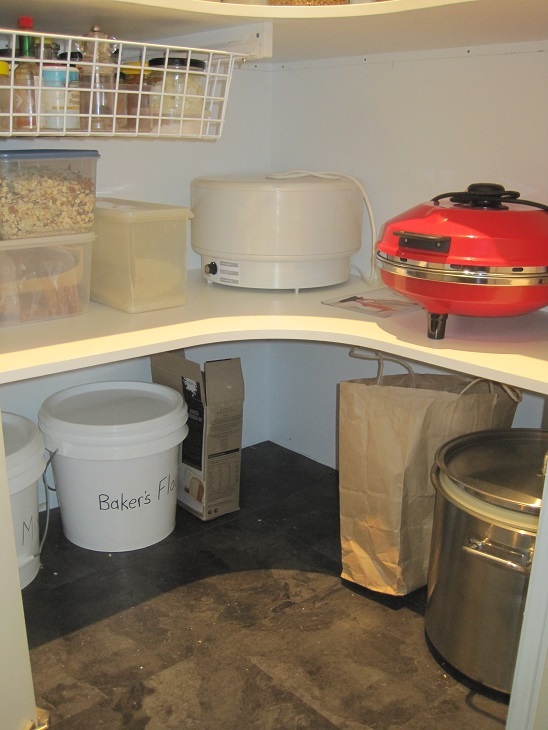 I have finally finished revamping the pantry and this is the result. I threw out a couple of bits of foodstuff – a few crumbs of powdered mustard in a tin that must be at least 10 years old, some jam that had gone mouldy and a handful of glace cherries that were over 12 months old and were all dried and shrivelled. I had about 3 bottles with a tiny bit of oil in each so that was all decanted into the current bottle. 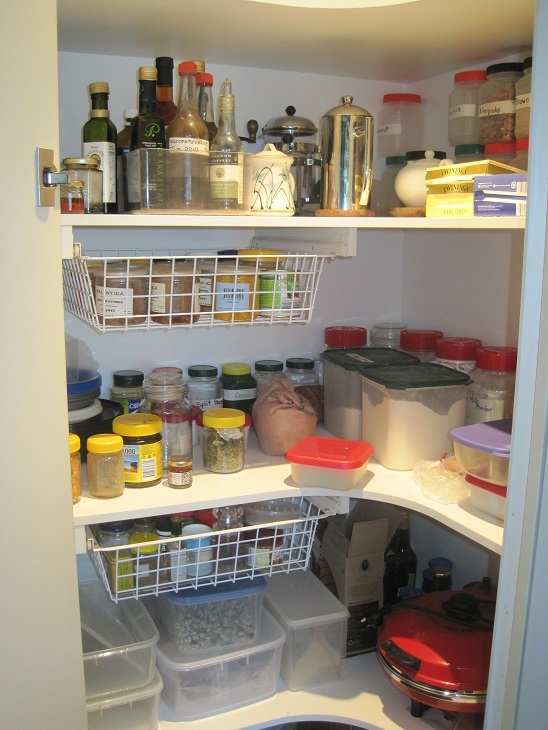 I now know that everything in the pantry is useful, in working order or fit to be eaten. I also know exactly what is there and can work on using up some of the odd items which are not part of my regular basic stores.